Taylor Leier, who has one goal and is minus-5 in 31 games, will replace Tyrell Goulbourne when the Philadelphia Flyers face the New York Rangers at Madison Square Garden. 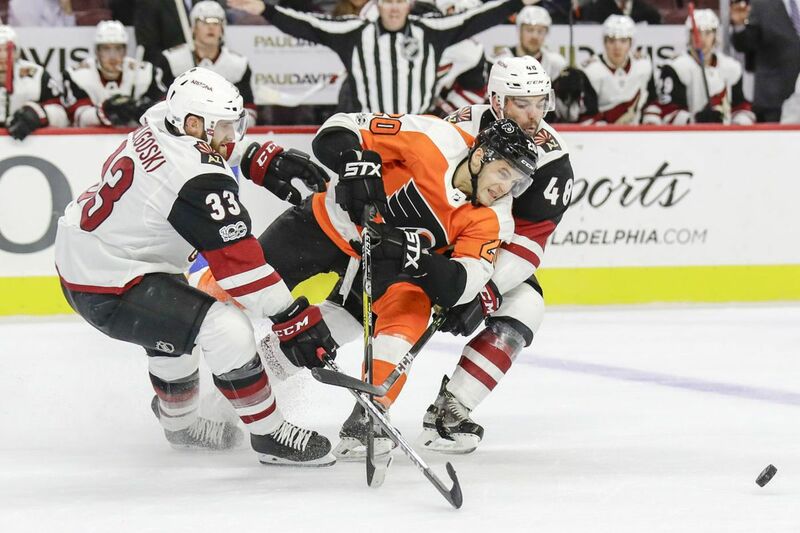 NEW YORK – After sitting out the last three games, speedy left winger Taylor Leier will return to the Flyers' lineup Tuesday night against the New York Rangers. Leier, who has one goal and is minus-5 in 31 games, will replace Tyrell Goulbourne, one of the Flyers' scrappier wingers. Leier "didn't come out because he played a bad game," coach Dave Hakstol said after Tuesday's morning skate at Madison Square Garden. "We put a different player (Goulbourne) with different abilities into the lineup and injected him into that line"
Based on the morning skate, Scott Laughton will center Leier and Jori Lehtera (0 goals in 25 games) on the fourth line. "I think Taylor is a confident player," Hakstol said. "I think sometimes the biggest challenge in that role when you're in and out of the lineup is the work you do on the days you're out. Taylor does that work. He's able to push himself through that ceiling on practice days and on game days when he's not in." Hakstol will pick his spots with Goulbourne, who averaged just 5:21 of ice time in his three games. Goalie Brian Elliott (2.75 GAA, .909 save percentage) will make his 18th start in the last 19 games and will be opposed by Henrik Lundqvist (2.58 GAA, .923 save percentage), the Rangers' lone all-star. The Flyers, who can move ahead of the Rangers with a win, are two points behind the Islanders, the team that holds the last wild-card spot in the Eastern Conference. The Isles host the Devils on Tuesday. "It's a four-point game for both teams," right winger Wayne Simmonds said about Tuesday's matchup at Madison Square Garden. The Flyers have the Eastern Conference's longest current winning streak – four games. "We've been steady and have been keeping the same mindset," Simmonds said. "Everyone's playing north hockey, getting pucks deep, and we've eliminated a lot of turnovers in the neutral zone." "We're playing with more determination," said center Sean Couturier, who is tied for third in the NHL with 25 goals, behind only Washington's Alex Ovechkin (28) and Tampa Bay's Nikita Kucherov (27). "We know there's only a half year left; it seems like a lot, but it's not that much when you look at it. If we want to make the playoffs, we need to make a push here." The Flyers have more scoring balance since Jake Voracek was dropped from the first to second line. They now have three lines with dependable scorers: Claude Giroux and Couturier on the first line, Voracek on the second line, and Simmonds on the third line. "I think it makes it a little bit harder for other teams to check us because we're a little bit more spread out (with the scoring), and it seems to be working," Simmonds said. The Flyers have lost six of their last seven games (1-4-2) against the Rangers, who will take a three-game losing streak into tonight. Simmonds has four goals in his last six games. … Defenseman Ryan McDonagh (19 assists, plus-10) took part in the morning skate and the Rangers said he would be a game-time decision. He missed the last game with back spasms. Rangers center Kevin Hayes (10 goals) will again be sidelined by a leg injury. … Defenseman Robert Hagg, the Flyers' best rookie thus far, is second in the NHL with 142 hits, and he leads all rookies with 59 blocked shots. … Giroux needs six goals to reach the 200 mark.